The local TV station ran a story about me and taped me riding bikes with my friends at the day care. One of the daycare parents, Heather organized a fund-raiser. She worked hard to make it successful and our family was very humbled by her kind heart and desire to help others. My parents knew our time together as a family was short and they wanted to make sure that we finished things we had started and that we created every memory possible. My dad had wanted to legally adopt us from the day that he and mom were married. Due to all the time spent apart working and in hospitals along with the legal costs, this had not been completed even though I had always been known as Brock Walquist. A very kind man named Lee, heard about this and offered to pay the legal fees to have the adoption finalized. Mom and dad told us that we could choose our own middle names, but that our first names could not be changed. Mitch and I really liked the Teenage Mutant Ninja Turtles and decided that each one of us would have our favorite character as our middle name. Mitch would be Mitchell Leonardo Walquist and I would be Brock Michaelangeo Walquist. Before the names were entered into the documents our parents told us to practice writing them out on paper because that is how we would have to sign them the rest of our lives. After a few tries we decided that it took too long to write out our new names and we decided not to have middle names at all. We went to the courthouse and each one of us was called to the stand to talk to the judge. I was first and they called me by my birth name which I had never used. The judge asked me if I wanted Tracy Walquist to be my dad, I told the judge he is my dad. After a few more questions I went back and sat by mom while Mitch was asked the same questions. I told mom that I didn't think the judge was very smart. He didn't know who my dad was and he didn't even know my name. When dad took the stand the judge asked if he wanted to be our dad and he said yes. The judge told him that he would be responsible for us in every way, including financially and given the amount of the pending medical bill that was a lot. He also asked if he wanted to finalize this adoption knowing full well that I would be dying soon. Dad said he did. The judge said he was proud of dad and wished our family all the best and we left the courthouse officially as the Walquist family. Many other people in the community also did amazing things for my family. I was able to go the NFR rodeo as an honored guest. All the cowboys came into the grandstand to meet me then took me down to the corrals where I was able to ride on the horses with all the queens. What a lucky little cowboy I was. I had my autograph book with me and they all signed my book. When one of the cowboys was getting ready to sign my book I had to help him because he was going to sign on the page that Minnie Mouse did and I told him that he would have to sign another page because she put hearts on her page. A friend of our family, Shannon, owned a local florist shop and she would send a balloon bouquet to me every week. She sent the coolest balloons. They came in all shapes and sizes and there were always a lot of them. Every time they arrived I would look through them, pick my favorite and then go outside and let it go. Mom asked why I did that and I told her I was sending it to Jesus. I asked mom if she would send me balloons when I was with Jesus and she said she would. Our family went to the Monster Truck show and we were able to meet all the drivers and have our pictures taken by the trucks. 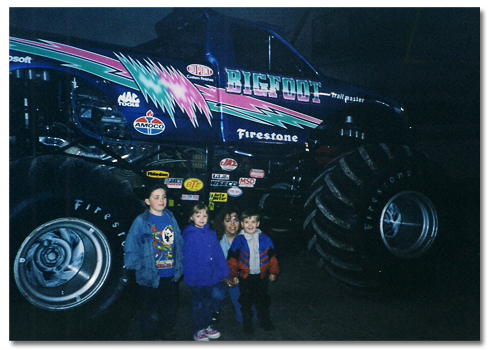 Afterwards mom and dad bought us models of Bigfoot that we put together to go with our picture in front of the truck. It was really cool and those trucks were so big. Mitch and I spent as much time in the sand pit with our trucks as we could. 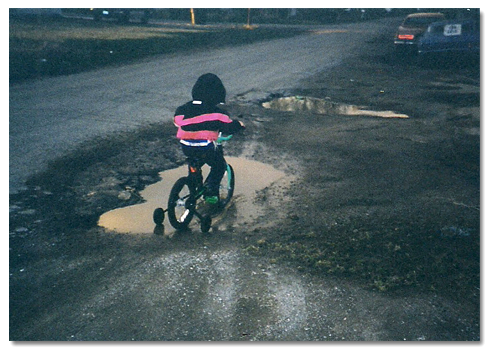 We also would ride our bikes up and down the street making sure to hit each water puddle. Whenever we would find a deep puddle we would spin out and it would send a strip of water up our backs. We sure had fun just being brothers and doing all these fun things together. 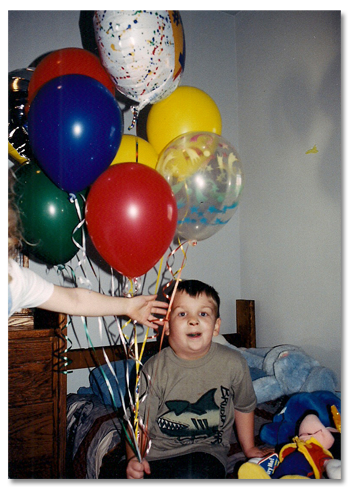 I asked mom one day if I would be alive long enough to have one more birthday party. She told me that she would make sure I had one more. That day she went to the store and bought some presents, a birthday cake and decorations. It may not have been my actual birthday, but it sure felt like it.